Make your weekends special joining the activities designed and hosted by influencers in fashion, fitness, lifestyle, adult entertainment, travel, arts, wellness, and much more! Buddy up with your Instagram crush and their followers in memorable Theme Weekend Meetups all around the world. 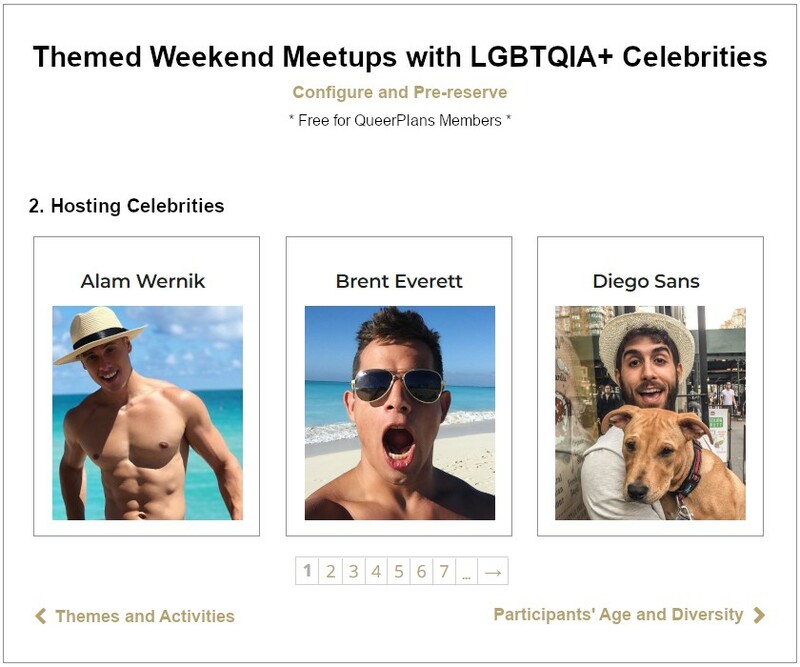 Buddy up with your Instagram crush and their followers in memorable Themed Weekend Meetups all around the world. Customize your Meetups down to the last detail choosing the Themes, Hosting Celebrities, Locations, Age and type of participants you like. 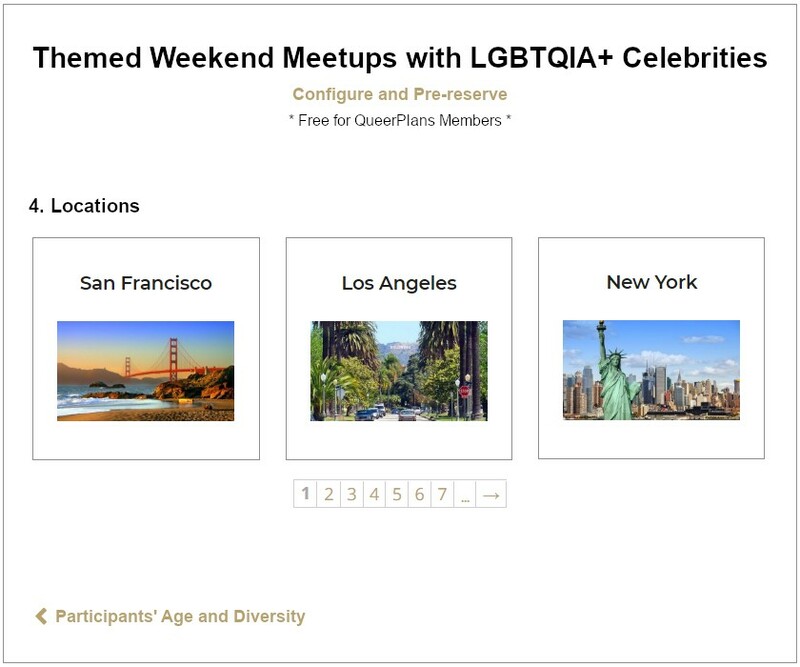 QueerPlans members can customize their Meetups down to the last detail choosing the Themes, Hosting Celebrities, Locations, Age and Type of participants as they like. All activities during a Meetup are designed by the hosting celebrities based on the Meetup Themes. Members can choose among dozens of predefined Themes or add new ones. Each Meetup is hosted by two LGBTQIA+ personalities. New hosts from different fields will be added every week based on the votes from our members and others will disappear, so make sure you don’t miss the hosts you like!!! Make friends and have fun with the people you like. You can select the age range and type of participants you prefer. There are currently more than 120 major permanent locations worldwide. Besides, members can pre-reserve Meetups in any other cities around the world, which may become temporary or permanent locations based on their popularity. Make friends and have fun with the people you like. 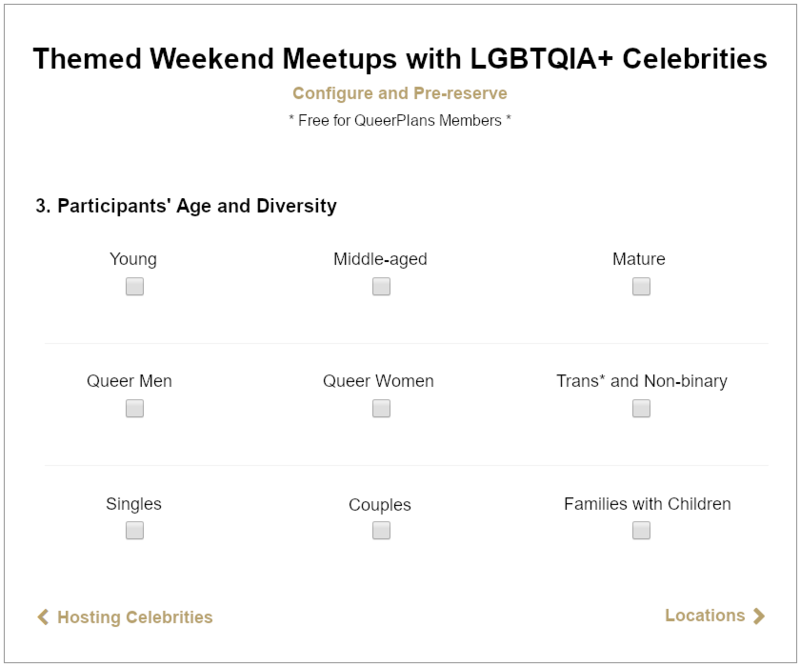 The age range and type of participants in each Meetup is completely customizable. 1. Get your QueerPlans membership. The annual fee is now 99€ 49€/year – current offer for new members. 2. Customize and pre-reserve your place in the Weekend Meetups you like in any location around the world for FREE. 3. Join as many Meetups as you like. Each Weekend Meetup has a fee ranging from 99€ to 299€ per person, which includes all group activities with the hosting celebrities.